Makerspace Technologist Catherine Addington went to Washington and Lee University to give a workshop in digital humanities through a Mellon-funded collaboration with the WLUDH. More information about this initiative can be found here. Her post is cross-listed on the W&L blog. I am a graduate student in Spanish, a freelance writer, a newsletter creator, a former full-time media professional, a prolific blogger, a website manager, and an incessant tweeter. As such, I felt particularly excited to be invited to give a guest lecture in Prof. Sydney Bufkin’s course, Writing in Public, as part of the Scholars’ Lab collaboration with Washington & Lee University. In order to give students direct experience with public writing themselves, Prof. Bufkin had encouraged them to purchase their own domain name, set up their own website, and try out a Twitter account. I visited during the last week of classes to describe how I had used these tools in my own career, and help students envision how they could use them after the course draws to a close. Model both personal and professional relationships with an individual digital presence for students. 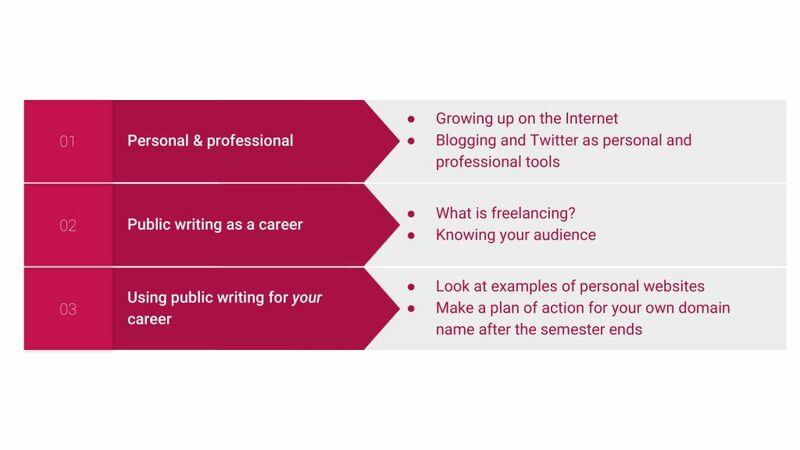 Inform students about public writing careers and the publishing process, particularly as a freelancer. Lead students in brainstorming plans for their own domain name and Twitter account. The text of my talk follows. The presentation slides are also available here. Thanks to all of you and to Professor Bufkin for having me. I’m currently a graduate student in Spanish at the University of Virginia, but I’m also a longtime public writer, onetime professional journalist, and a part-time website manager. I’ve called this talk “Writing in Public (on Purpose)”, but the subtitle is what I really want to focus on: how to grow up on the Internet and reverse-engineer that into something professional. Because that may be the one thing in which I am a bona fide expert. So today I’m going to talk to you about my own relationship with public writing, and hopefully help you to work out what you’d like yours to be. But I’d like to start with a short exercise: please Google yourself. Don’t worry, I’m not going to ask for results. But raise your hand if you found something positive, something you’re proud of. Now raise your hand if you found something negative, or something you feel is kind of silly. Now raise your hand if you found nothing in particular. You can see for yourselves: most likely, you’re going to have an Internet presence of some kind. It’s just a question of how much control you have over it. Today I want to share with you what getting control over that looked like for me, and what it might look like for you. First, I plan to discuss my own experience with balancing personal and professional public writing. Then, I’ll describe what public writing is like as a career. Finally, I’ll turn it over to you all to workshop how you can use public writing for your own goals, and specifically what you plan to do with your domain name once this class ends. My first website was a fandom-heavy Tumblr, and an angsty teenage diary. I didn’t think of this as public writing at the time. My friends and I all used Tumblr as a social network, not a blogging platform. It was all Champions League highlights and emo song lyrics. But because someone felt the need to run my account through the Wayback Machine, this early iteration of my Tumblr blog, and the various URLs it took on later, are preserved for posterity. 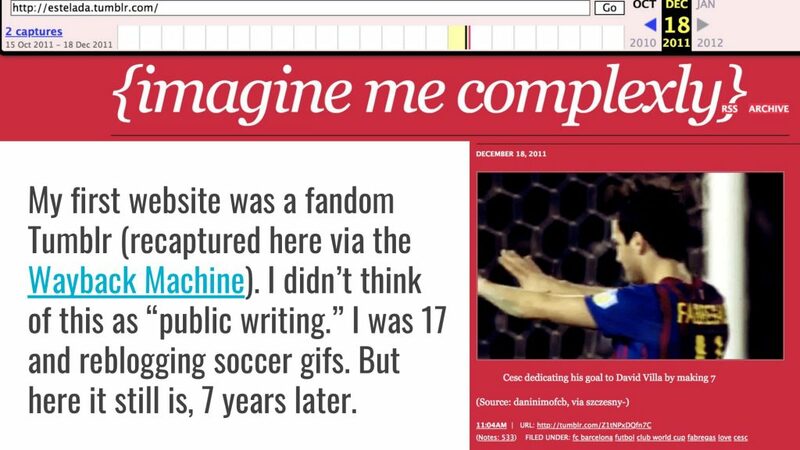 That’s actually still my website, but now it’s a portfolio and blog, too. If you go far back enough in the archives, you’ll still find plenty of fandom and angst. In fact, you’ll still find plenty of both. What’s changed is my intention and self-awareness about it being a public-facing platform. Similarly, my Twitter also started out as fan enthusiasm. 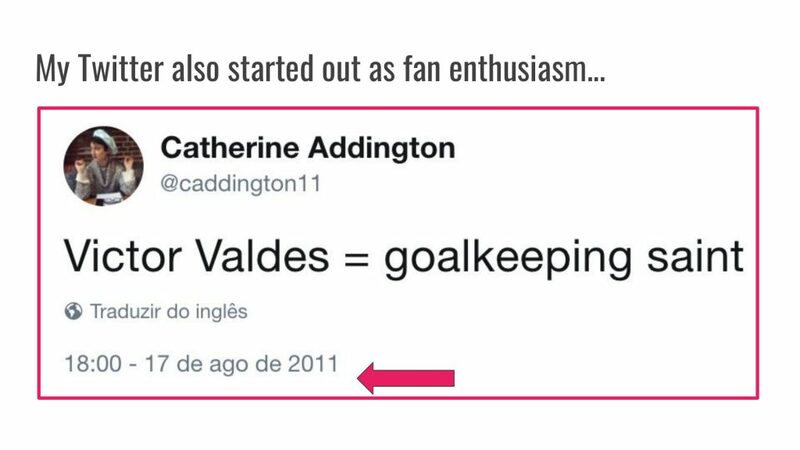 Here you can see me waxing poetic about FC Barcelona’s former goalkeeper. Be able to laugh at yourself (and forgive yourself, when you need to). Everyone has had a phase they wish everyone else would forget. Nobody cares about your embarrassing memories as much as you do. The Internet has not fundamentally changed this, we just have to laugh at ourselves a little louder. Personality is an asset. People actually do not want the sum total of your human existence to be a soulless LinkedIn page. I mean, you might need a LinkedIn if that’s common practice in your field, but just remember that people like people, not brands. I once interviewed a potential intern because she worked on a blueberry farm. Of course, she actually got hired because she was qualified and seemed like someone we’d enjoy working with, plus there are real professional skills from working on a blueberry farm—talk about initiative and teamwork! But being able to actually stand out from a pile of papers is a good thing. More importantly, there’s more to life than work, and you are going to want to spend it as a person, not an idea. Kill it with excellence. This is my main strategy, to be honest. You can’t always take things back, but you can often drown them out. The Internet is great for making a lot of noise. People are welcome to dig up my nonsense tweets but they’ll have to pass by a fair amount of intelligent conversation to get there too. 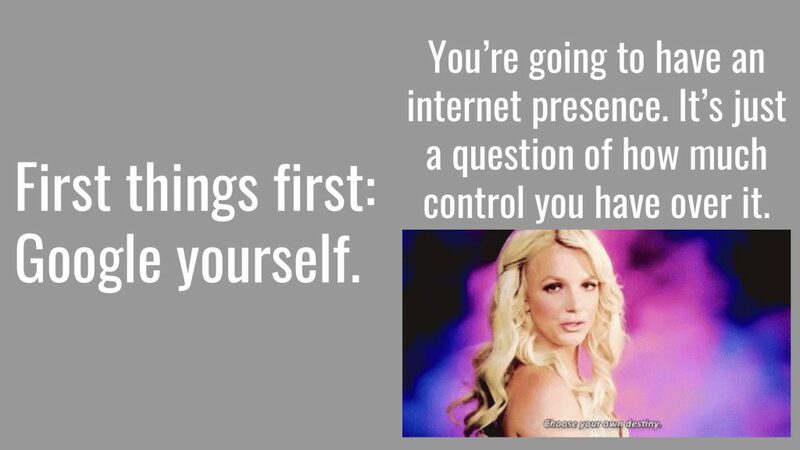 Now let’s put that into practice and talk about how to professionalize your digital presence. I used two main tools for this, and they’re the same ones you use in this class: a personal website and a Twitter account. As I see it, the personal website has three main functions: place, process, and product. Place: the personal website as business card. Many professionals have a website that includes a short bio, links to their social media, and ways to get in contact. Some include a print or digital version of their resume as well. Process: the personal website as blog. Sharing “process” writing looks different for everyone. It can be a reflection on your study abroad travels, a step-by-step description of your latest experiment and results, a discussion of the readings you did for class, or even just stray observations from your day that you find interesting. Personally, I develop ideas best in conversation, and find that blogging is a good way to get feedback. I also use my newsletter, Cartas de América, for this purpose—that’s where I talk to friends and readers about my academic research. Product: the personal website as portfolio. Sharing “finished products” will also look different for everyone. 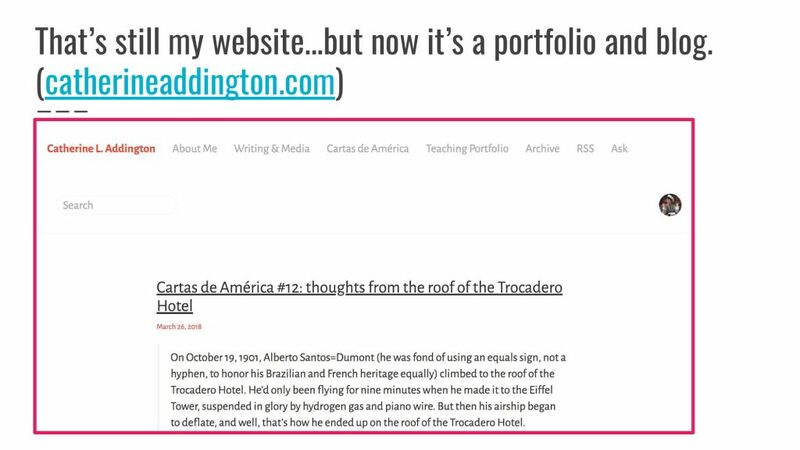 I have two of these: a “writing & media” tab for published writing and podcast episodes, which I link at the bottom of my resume; and a “teaching portfolio” with example lesson plans and a statement of teaching philosophy. For you, it might be a multimedia gallery with art or design samples, a list of relevant coursework and job experience, a web store, or photos of events you’ve planned or projects you’ve collaborated on. As for Twitter, making it not just my personal thoughtstream but also my professional network was a complicated process I’m not going to get into here, but I will say this. Twitter is a great place to get mentorship, directly or indirectly. Follow people who have your dream job, and watch how they use it. Classroom instruction will often prepare you with the existing knowledge in a field, but online conversation can inform you about what those same experts are working on next. Twitter is a good way to plug into conversations you might not have access to in your daily life as a student. Moreover, it gives you the opportunity to talk with professionals who are where you want to be—and lets you get your name in front of potential future employers, too. I’m not saying that it’s essential for you to have a personal website and a Twitter to be successful in life (though they help a lot if you want to work in media). I’m just saying it worked for me. You might need different tools depending on your own goals. But I do think that over time, digital literacy is becoming less “impressive” and more “expected.” Even if all this isn’t a “requirement” for your field, it may be an opportunity. 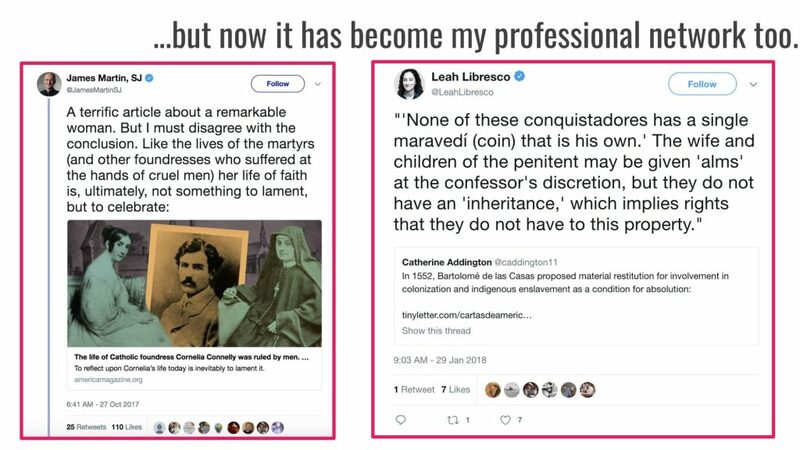 Now that we have an idea of how to balance a personal and professional online presence, I’d like to share with you what I’ve done with mine and talk briefly about public writing as a career. I want to emphasize that I only worked one year as a full time journalist—and actually I spent most of that time producing a magazine, not writing for one. Most of my writing has been published as a side gig while a student, both undergraduate and graduate. This is called “freelancing”, and it paid my rent for several months this past year. (And if you’ve got friends in Charlottesville you know that’s saying something!) I want to highlight that up front to remind you that you’re already in the so-called “real world,” and what you think of as hobbies (like extracurriculars, clubs, fundraising, volunteering, events) are giving you real professional experience that you can and should frame as such. Freelance writing is a fairly straightforward process: pitch, edit, and publish. 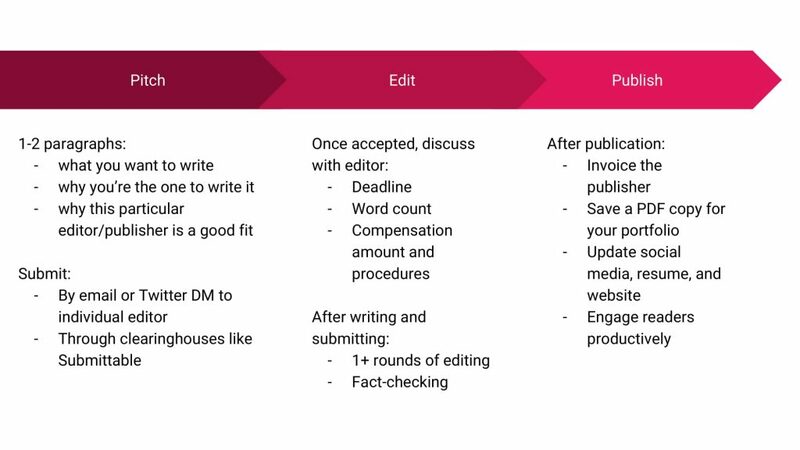 A “pitch” is just media lingo for a proposal: briefly explain what you want to write, why you’re the one to write it, and why this particular editor or publisher is a good fit. Each magazine or outlet has their own process for taking pitches, and usually they’ll post that on their website. But I usually contact individual editors—often people I’ve met through Twitter. In fact, most of my pitches have started as conversations or DMs on Twitter. The next step, once a piece is accepted, is to discuss expectations with the editor. I always ask for a deadline, a word count, and an idea of my compensation amount and procedures right up front. Some places pay upon publication, others upon acceptance of your piece. I want to pause here to encourage you to resist our collective social allergy to talking about money. This is especially crucial for freelancers, because plenty of places won’t pay you if you don’t explicitly ask to be paid. Young writers are particularly easy to scare with the concept of “writing for exposure.” But writing is work like any other, and you should be paid for it. I only give stuff away on my own terms (i.e. a blog)! This applies not just to writing, but to any professional field—do not be afraid to get and give straightforward money advice. After writing and submitting, a piece will go through rounds of editing and fact-checking. This usually happens on the magazine’s end, though sometimes a writer will be contacted with fact-checking questions. That’s why it’s important to carefully reference sources in a draft, as though writing academically, even if it’s a totally different medium. Once the piece is published, celebrate, because that’s awesome. And if you haven’t already, go get paid: invoice the publisher for the agreed-upon amount and keep a record for tax purposes. There are great online templates for invoicing freelance work of any kind, writing or otherwise. Meanwhile, I always make sure to save a PDF copy of my published work, since URLs aren’t stable. I also update my social media, website, and resume with any new pieces that I’ve published (which we call acquiring “clips”). The last step is crucial: engaging readers productively. That adverb is doing a lot of work. It means I don’t read the comments unless I’m prepared to see cruelty, but I do try to engage in interesting conversations that arise on Twitter in response to the piece. After all, what’s the point of public writing if you don’t actually want to talk to or hear from the public? I want to share two examples of this process from my own work, that I think exemplify varying degrees of success. Here’s the first one: one time at a work event in DC, I met an editor for The Spectator, which is a conservative British magazine with a significant following. I really like a lot of their arts and culture content, but I don’t personally share the magazine’s politics, so I wasn’t sure if it was a good idea to pitch the editor. But I also thought it would be a good opportunity to share my own perspective—and of course to get my name in an old, fancy magazine. So I pitched the editor on something I knew would get his attention: the then- (and still-) collapsing political and economic situation in Venezuela. Everyone likes a story about their political enemy doing poorly, and Latin America happens to be my academic specialty. The article was accepted, and the result was…interesting. 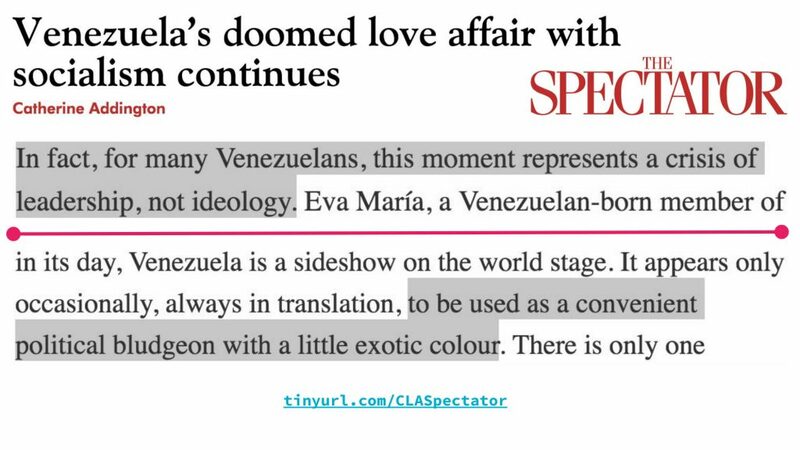 As you can see here, the headline that the editors put on my article was exactly as I expected: look how terrible socialism is. But in my article, I argue that authoritarianism, not socialism, is to blame. My instinct was to take a self-aggrandizing lesson from this: well, when you’re a public writer, you have to be prepared for the public to see whatever they want to see. I think the real lesson is one in humility: you need to own your work. If you want to pick a fight—which I clearly wanted to here—you need to actually do that, instead of trying to sneak in your viewpoint. It’s a matter of respect for your audience. A more successful example of writing to a specific audience is this article I wrote for my former employer, The American Conservative. On the left, you have my undergraduate thesis, which you will not be surprised to hear was about soccer (specifically in Argentina). On the right, you have an article I wrote during the summer of 2014, when the World Cup was on. In the article, I used my thesis research to argue that Americans denouncing soccer as European and therefore socialist are playing into a long tradition of denouncing and then adopting foreign customs. Because that’s exactly what happened in Argentina—they denounced soccer as an English import but over time it became the popular obsession it is today. 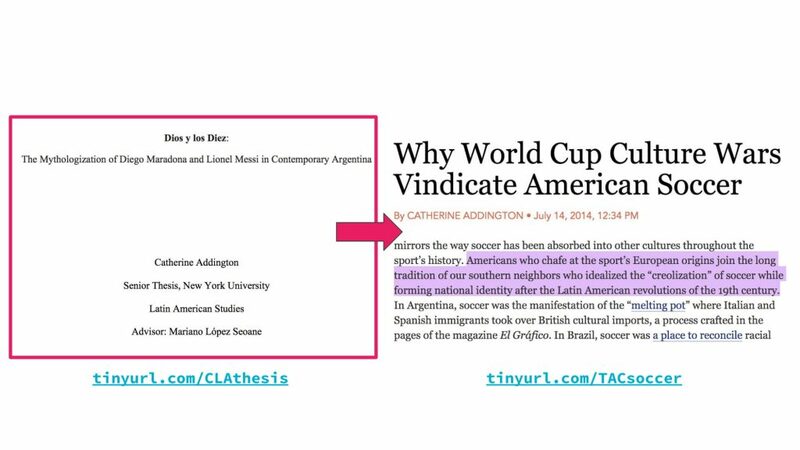 This article was more successful because I wrote with my audience in mind: they would likely be aware of the ongoing World Cup, and may have seen other conservative publications’ negative reactions to it. I took that established knowledge as the point of departure, and added more context. Instead of trying to sneakily insult my audience’s opinion (like I did in The Spectator), I directly engaged and responded to events that my audience would be familiar with. Most of my public writing career consists of work like this, taking scholarly research and turning it into public writing—and taking work about Latin America and making it accessible for an English-speaking audience. Now that I’ve shared my own experience with public writing, it’s time to turn it over to you. But I doubt that all of you are in the very specific market of writing for niche magazines about soccer, saints, and Latin American politics, so my roadmap will be of limited use. So I want to start with the basic premise of project management: identify your goals first, and then pick the tools best suited to execute it. When someone mentions you in conversation, what do you hope it’s in reference to? What do you hope people associate with you? 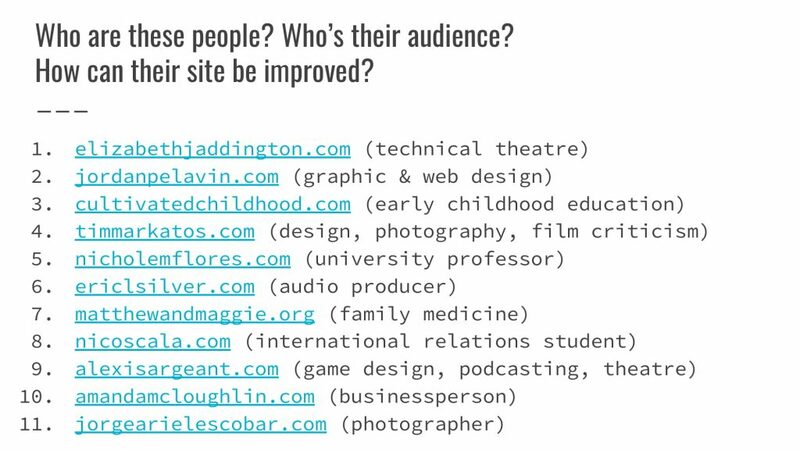 Whom do you imagine as your target audience—the people reading your website? Family, friends, coworkers, industry experts, potential employers? Now, let’s look at some examples of what other young professionals have done with their personal websites. These are all people I know in real life, and few of them are professional web designers, so I want you to keep in mind that all of this was done with free or cheap tools to which you also have access. Based on this person’s website, what do you know about them? What are you likely to associate with them? Whom do you think is this person’s intended audience? How does their website reach that audience? What do you like and dislike about the website? How could it be improved? What elements of the example sites you looked at, if any, would help you achieve the goals you laid out in your brainstorm session? Think about the personal website as process (blog), product (portfolio), and place (business card). Which of those three elements would be useful to you, if any? I’ll leave you with a few recommendations for further reading and research pertinent to the topic. If you have any questions, feel free to ask now or get in touch. 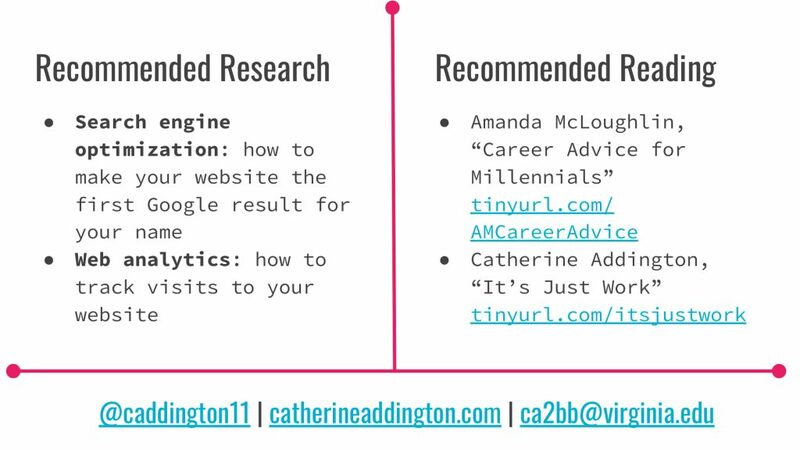 Cite this post: Catherine Addington. “Writing in Public (on Purpose) at Washington & Lee University”. Published April 02, 2018. https://scholarslab.lib.virginia.edu/blog/writing-in-public-on-purpose-at-washington-lee-university/. Accessed on .